A little information on what makes the picture special to you! So send those photos, I look forward to seeing them! The Main Street Electrical Parade, also known as the Disney Electrical Parade, is my favorite parade at Walt Disney World. I know a lot of people don’t like it because of the music, but I love the floats so much more than I did Spectromagic, which played for several years. In my mind, the Main Street Electrical Parade is just a better parade to enjoy! Did you know that the predecessor to the Electrical Parade is the Electrical Water Pageant, the show that you can see out at the Seven Seas Lagoon? 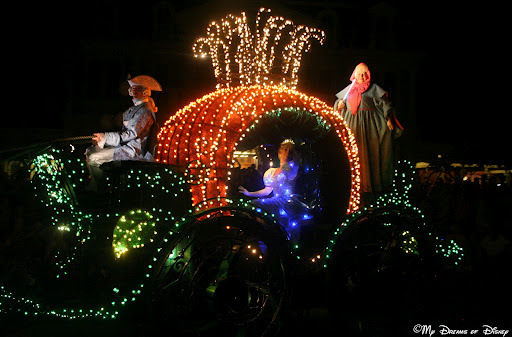 Did you know that there are over 500,000 lights on the floats for the parade, and that the new LED technology bulbs use just 1/4 the electricity that the original parade did? Did you know that the music for the parade is taken from the “Baraqoe Hoedown”, which was written in 1967 by Gershon Kingsley and Jean-Jacques Perrey? I have several favorite floats of this parade, so I hope you enjoy all my photos!